Part one of this two part post garnered a lot of reactions on several Facebook forums. Some comments spun off into tangents and irrelevant topics of debate but for the most part, Peter Carmichael’s perceived words and Kevin Levin’s additional comments met a lot of criticism from Re-enactors. I want to take this moment to point out that the previous post did highlight a few limitations that most Re-enactors have in regards to history. 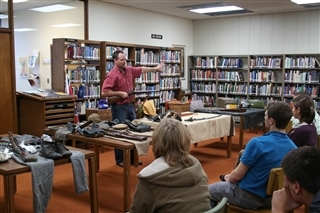 I leveled criticism at presumptuous Re-enactors that give misinformation about the war and its causes, but at the same time, I highlighted areas where Re-enactors are terrific assets to Civil War education. In this post, I want to turn the attention towards the rift among academic historians and where the public, and Re-enactors, fit into that argument. Reading those lines reminded me of a wonderful article by historian John A. Lynn entitled “The Embattled History of Academic Military History” (pdf here) . In his article, Lynn addresses, in detail, the academic rift Brooks alludes to. I pointed out the “battle lines” in Part 1, though it bears repeating with more emphasis. Academic historians are divided over emphasis of study. Some historians, namely Academic Military Historians, tend to focus on military operations/strategy and politics. Other Historians place more emphasis on race, gender, and class, or as some Historians term it, The Holy Trinity of History. Lynn points this division out more poetically. Military history has never been a popular specialty among academics; on the contrary, it has always been something of a pariah in U.S. universities. We used to be condemned because we were believed to be politically right-wing, morally corrupt, or just plain dumb. One of my friends at Illinois snipes that “Military history is to history as military music is to music” and inquires if military historians write their first drafts in crayon. But from bad we have gone to worse, much worse, and the flow of historical fashion is very much against us and promises to remain so for the foreseeable future. I do love that last line. I highlighted one part in particular of Lynn’s article because it rings too true. I have heard, more than often, historians express their disinterest in battle strategy, operations, and maneuvers while maintaining that it does not develop any deeper understanding of the war. I mean, Heaven forbid if we focus on warfare while studying a war. Remember Kevin Levin’s statements in part 1? The “tough questions?” I think it’s easy to figure out what side of the division Kevin falls on. Granted these are hot topics and subject to trend. Lynn spends several paragraphs analyzing publications, and The American Historical Review’s preference for the “new holy trinity.” He also focuses on the History Department trends across the country. The elitism of “cutting edge” historians or as Brooks Simpson describes it, “the snobbery,” does create hostility towards those historians that focus on what Lynn terms as things of “concrete value,” (i.e.political, diplomatic, and military history). Precisely because it is rejected by the cutting edge. So where does the public fit into all this? As Brooks pointed out, the public seems to have a preference for the military and political value of history. The “snobbery” of elitist historians chalk this up to a mindless appetite for gore. Perhaps there is some truth in that. 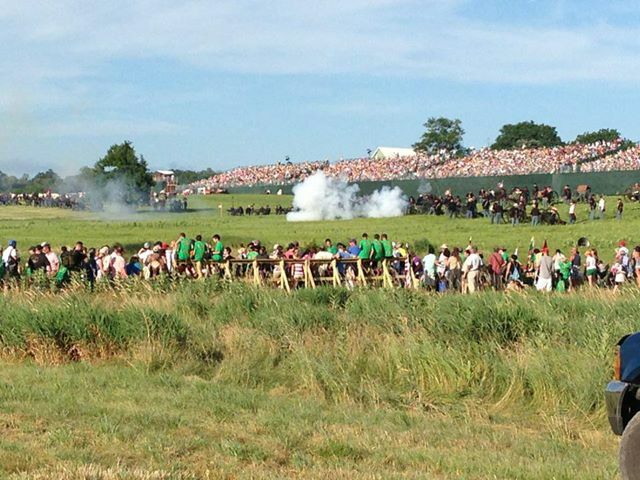 Maybe even Peter Carmichael was right in his belief that battle re-enactments turn war into a spectator sport. Given the grandstand bleachers at the GAC’s 150th Gettysburg re-enactment, Carmichael may very well be right. But I choose to appreciate the value of military history on every level. That includes strategy, operations, and tactics down to the very micro examination of how a soldier fought and why he fought that way. That is why I re-enact. To achieve some small measure of experience and to adapt to a particular schema. To explore the difficulties of covering ground while staying in tight formation. My academic study of war however, goes beyond the simplified picture of re-enacting. My particular interest, to shed light on me, is an examination of the culture of soldiers and how that impacts their preferred way to fight wars. I tend not to chalk up every act of violence towards black soldiers in the Civil War to “racism.” Though I certainly do not disregard it. I try to think about specific cultural issues, not only in race but also in the manner of fighting and reaction. But one thing we must never do, when studying war, is to overlook the examination of Battle. For battles are what truly separates periods of war from other moments in time. I am reminded of an earlier post of Kevin’s. Some of you know that while I enjoy visiting battlefields I am not preoccupied with tactical details. I do not give much thought to the alignment of units or try to nail down exactly where they were. Give me an overall sense of what happened and I am good to go. I’ve never given much thought to Second Manassas beyond the strategic level; in fact, this was my first time on that particular battlefield. To watch John lead a tour is to watch a masterful storyteller, who has thought deeply about what the battlefield has to teach us. He moved seamlessly between the strategic and tactical levels as well as the political implications of the campaign as it unfolded. He even asked the group to reflect on questions related to memory. We stopped at places like Brawner’s Farm, the unfinished railroad, and Chin Ridge and John went into great detail about the action that took place there. John, however, didn’t simply describe the action that took place there and share first-hand accounts, he explained why doing so is important. He suggested that we need to engage in a little imaginary discipline and understand that the ground under the soldiers feet at any given moment constituted the entirety of the battle. This was a revelation to me. I’ve always remained detached from this perspective since I was only interested in the larger picture, but for the first time I was able to see the battle as a collection of more localized encounters that were self contained for the men involved. How the broader battle might unfold is irrelevant from this perspective. What matters is maintaining formation, holding ground, and looking after the man next to you. The result was a personal connection to a battlefield that I have not experienced anywhere else. After reading this post I believe Kevin is answering his own tough questions and developing a deeper understanding of the war. He is not only studying aspects of race, and those big broad questions, but those small minutia details. What soldiers thought, what hey held dear and how they fought wars come to light as Kevin crosses the field. We should follow his example to answer those “tough questions,” whatever they may be. John A. Lynn, “The Embattled Future of Academic Military History,” The Journal of Military History, Vol. 61, No. 4, (Oct. 1997) pp. 777-789. As you know, though I do work at one of the largest Civil War battlefields, my interest in Civil War history leans toward the social implications. That being said, I do agree that generally, military history necessitates the study tactics, strategy, politics of command, etc. From my perspective (and I’ve not really delved into the broader argument between living historians and academic historians, other than my own observations and musings), the issue with these issues in academic history in relation to the Civil War is this: IT’S BEEN DONE BEFORE! Not only that, IT’S BEEN BEAT TO DEATH! I don’t believe that there is a period of United States history as extensively studied as the Civil War period. I mean, we are to the point that academic military historians of the Civil War publish books that openly admit that their book contains nothing that could not be found elsewhere. For instance, Steven Woodworth’s Six Armies in Tennessee: “The purpose of this book is to provide a narrative synthesis of the entire campaign and a new and thoroughgoing analysis based on both the mountains of information that other historians have turned up and on the original sources. It may not present readers with any particular detail that could not be found somewhere in the voluminous and sometimes contradictory published literature pertaining to these events, but it should give them a better overall grasp of the broad sweep of the action in these momentous campaigns.” He admits that this is nothing new, and that he’s turning over used soil. Don’t misunderstand, I think that this book is valuable for bringing the war to the public, but it’s scholarly merit, in my opinion, is questionable, and this is about a campaign that pales in comparison to the avalanche of research that has been published about Virginia, Gettysburg, or even Vicksburg. Now, I do believe that military history is necessary and valuable. War often at least shapes public opinions, involves numerous perspectives about politics and society, and sometimes literally carves new nations out of existing ones. With the Civil War, however, these issues have been mulled over many many many times, and really all you are left with are the inconsequential minutia (such as what size horseshoe General Thomas’s horse wore on it’s back left hoof) and the byproducts of war that intermingle military history with other fields of history, such as the experiences of soldiers and bystanders (which I believe are social issues) and environmental implications. Also, I do agree with you that re-enactors have the potential to play a crucial role in connecting the public with history and heritage, but not when they are engaging in revisionist history and not when their focus is the minutia. In my opinion, minutia must be tempered with broader social concerns for the time, which then, I believe, lead into discussion of concerns in our time. I agree with the sentiment of “its been done” and “beat to death.” But at the same time, new information emerges that bring to light new understandings of “battle.” For example, Edwin Coddington’s “Gettysburg” is the staple of work. However, Stephen W. Sear’s narrative on the campaign provides incredible depth and perspective that differs from Coddington’s work. Then finally, Allen C. Guelzo’s new book on Gettysburg, provides even more information. Like you said however, those men admit their predecessors and yet write on. I do enjoy social history, I am practically crossing social and military history in my work. Yet I do not think social history is merely theoretical history. I think concrete value histories should not be sacrificed to theoretical work to any measure, which is by my observations, a lot of what the “rift” is over. I agree with you about Re-enactors engaging in revisionist history. I’ve heard it. I disagree about the minutia though. Re-enactors have a gift for the minutia, especially when it comes to gear and things such as that. Often, the public ask these types of questions because it is right there in front of them, and far more interesting than words on a page to them at least. All good things, I hope lol. I see your point, but at the same time, the fact remains that it’s been done before. In many cases, multiple times. Yes, differing perspectives can illuminate obscure details and offer insight into differing historiographical traditions, but I feel that in this case, there are plenty of resources available already to learn about the tactics. When engaging in this type of research, how much are you really expanding knowledge and understanding, when there exist subfields of this period that are still largely untapped. As for the minutia, I have seen that many people are interested in the specific accoutrements. i’m just biased, I guess lol. There’s a reason I never got into reenacting; I’ve just never been that interested in that kind of thing. Absolutely. Apparently your narrative form gives him great joy. Fair enough, but remember I am not emphasizing merely tactics. I tend to focus more on why people fight the way they fight, and how does that fit into the civil military relationship of the time. Working for a museum where the minutia accouterments are merely the surface layer of a depth of knowledge, I’d imagine I would be biased too. You should try it sometime, living on water and hard tack for three days provides a unique perspective. Oh, don’t misunderstand me. I’ve heard some of your work, and I don’t hold it in the same category as strictly tactical history. I’m talking about some of the other works I’ve read recently, and really the field as a whole. Remember, in the first post I believe I stated that tactical history should be tempered with social or environmental or (your subfield here) history. You do that. By the way, are you coming to Chickamauga for the 150th programming? We’ve got some fantastic stuff on the docket. And yes. I need to get some days lined up and look into ticket purchases and all that jazz. I am saving my personal days and some sick days for it. More than likely my ventures will be weekend based.